This element allows you to graphically group process elements together. A text can be entered here that describes the affiliation of the elements in the box. Opens a dialog where the text can be entered in multiple languages. Click here for more information. The horizontal and vertical alignment of the description can be defined here. Opens a small palette where the border color can be selected. The box will be filled with color. Opens a small palette where the fill color can be selected. The box is fixed on the workspace and thus cannot be moved by mistake. 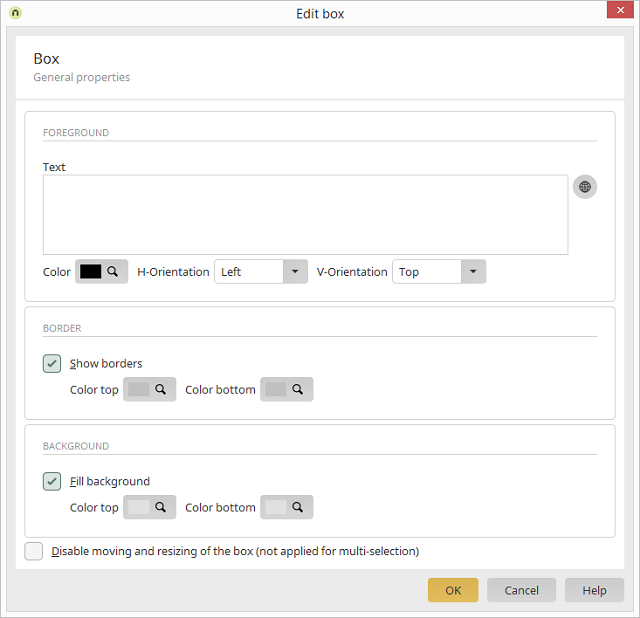 If multiple boxes are selected at once, then this setting has no effect.